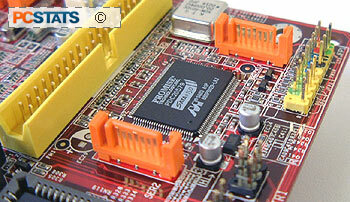 Abstract: The motherboard PCstats is testing today is made by MSI Computer, and based on the second generation VIA K8T800 Pro chipset. One of AMD's worst kept secrets was that Socket 939 would unite the mainstream Socket 754 Athlon64's with the high end Socket 940 Athlon64 FX processors. It all seemed reminiscent of the time when Intel released its Socket 423 Pentium 4 CPUs, only to have that formfactor replaced within a year by Socket 478 chips. Because of all this impending socket change, many enthusiasts and manufacturers stayed away from the Athlon64 for the first little while, instead deciding to lay in wait for a more stable Socket 939 platform to emerge. Now that AMDs Socket 939 is upon us, I expect there will be much more Athlon64 action in the coming months! 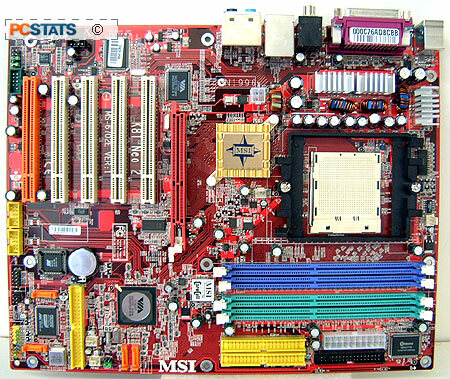 The motherboard PCstats is testing today is made by MSI Computer, and based on the second generation VIA K8T800 Pro chipset. MSI's K8T Neo2-FIR motherboard follows through where its successful K8T Neo board left off, and proves to be a compelling option for a little over $140 USD. The motherboard supports Socket 939 AMD Athlon64/FX processors, comes equipped with four DDR RAM DIMM slots that accommodate up to 4GB of dual channel PC3200 memory, and packs in a long list of features. For starters, the MSI K8T Neo2-FIR includes an additional Promise IDE/Serial ATA RAID controller, an onboard 7.1 audio setup, IEEE 1394a Fireware, Gigabit LAN as well as a standalone PCI 802.11g wireless network card! 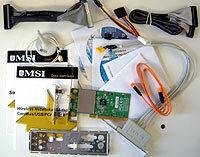 Around back by the I/O headers we find two Firewire jacks (one standard, one mini), four USB2.0 jacks, the 7.1 channel audio connectors, and an optical / coaxial SPDIF audio out connector. MSI has been using red PCB's with their motherboards for quite some time now, and I think they look pretty good! The K8T Neo2-FIR motherboard is quite colourful, with each connector colour coded to make installation easier for novices. For example, the front panel IO connectors are labeled with positive values so even newbies can set up the case LED's on the first go. The main IDE/floppy and ATX power connectors are in their most ideal location to the right of the DIMM slots, which is always appreciated. To help keep things clean and out of the way, the K8T Neo2-FIR has all its headers (firewire, audio, USB2.0, etc.) located along the lower edge of the motherboard PCB where they are out of the way.